Are you doing anything big for this coming long weekend? I wish we were, but at the moment our plans are rather minimal. Regardless of what we end up doing, I will, however, take the opportunity to spend a bit of time in the kitchen and make some kind of treat for the family. 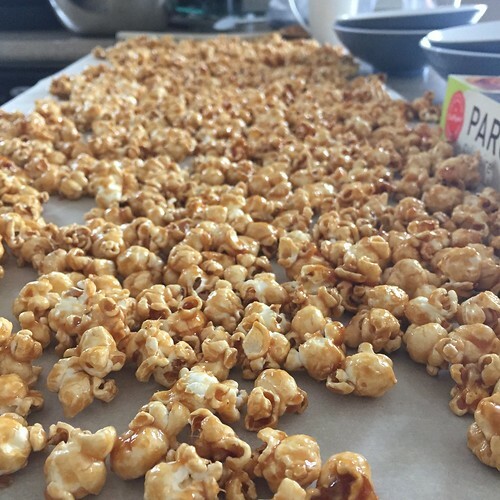 My MIL found this easy recipe for salty/sweet caramel corn online. We made it last weekend and I tell ya, it’s a keeper. I think I might have to make it again! The butter tart squares don’t require the usual pastry work and are very good. This maple taffy is amazing, and it only requires one ingredient: maple syrup. It’s the perfect edible kitchen project for your family day weekend! Share the post "If you make one treat this weekend, this should be it"
No Responses to "If you make one treat this weekend, this should be it"